Half a year or more without insulin injections – for many type 1 diabetics something hardly imaginable. It's precisely this scenario that American researchers want to bring to reality and to envelop beta cells in an algal polymer. Success with the method would not only be a win for those with type 1 diabetes. The Islets of Langerhans are a collection of endocrine cells in the pancreas. They account for about two to three percent of the organ’s mass. About 60 to 80 percent of the islet cells are beta cells, which produce the hypoglycaemic peptide hormone insulin, store these in β-granules and – if necessary – deliver them to the vascular system. 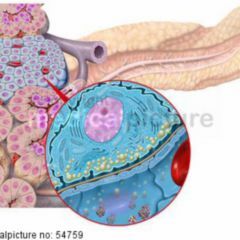 Insulin release is made possible by the fenestrated endothelial cells, which line the inner side of the blood capillaries of the endocrinal pancreas. It’s through these “fenestrations” (lat. fenestra) that the beta cells are kept in contact with the blood, whereby blood sugar levels can be “measured” and any response can be managed as needed. It’s precisely these cells that are attacked by the immune system and destroyed in type 1 diabetes mellitus. The result is an absolute insulin deficiency. Those affected therefore have a lifelong need to inject the missing insulin several times a day. On top of this, there are also – depending on the therapy – strict eating plans and separate blood glucose measurements to deal with. This requires good and responsible management on the part of the patient. This is because mistakes, such as incorrect calculation of the required insulin, or deviating from the eating plan, can become acutely life-threatening complications such as hypoglycaemia or the dreaded ketoacidotic coma. However, this insulin therapy treats only the effects and not the cause of the disease. One causal therapy approach involves the transplantation of islet cells. For this, the islets of Langerhans are isolated from a donor organ by way of an enzymatic digestion process, purified and infused into the liver via the portal vein. The reason for this is that the pancreas in diabetics degrades over time. The foreign islets move in the vessels, settle there and synthesise insulin. In the best outcome, the insulin supply from the implanted cells matches that of beta cells in the islets of Langerhans. The main disadvantage of islet cell transplantation is that the patient has a permanent need to take immuno-suppressants, since the immune system would otherwise attack and destroy the foreign islets. However, the adverse effects of these medications are more serious than a daily injection of insulin. There is in addition another matter: many diabetics are indeed temporarily insulin independent after islet cell transplantation. 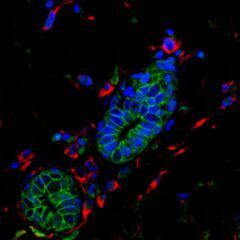 The insulin production of the introduced cells nevertheless decreases with time. The reason for this is the chronic rejection response and the redevelopment of the originally causative autoimmunity. Another problem is presented by the limited number of donor organs from which islet cells can be obtained. This is because, according to law, with respect to transplantation there exists a priority to transplant the entire pancreas as a whole organ. Only if it cannot be transplanted as such may the islet cells be isolated. The whole thing is still further complicated by the fact that in order to obtain a sufficient number of islets two or more donors are required. A research team led by Daniel Anderson of the Massachusetts Institute of Technology (MIT) [Paywall] had the idea of packing medical devices, intended for implantation, in a polymer capsule in order to protect them from the body’s defence system cells. The researchers chose to use one of the most commonly used hydrogel-biomaterials: alginates. However, these are also recognised by the immune system as foreign, enveloped as part of a so-called foreign body reaction in scar tissue and thus isolated. While looking for a polymer with reduced immune recognition, the scientists systematically examined more than 600 different, chemically modified alginates in-vivo in mice. The best results were obtained where using the group with three triazole components. The assumption of the authors is that these three materials change the surface of immune cells in such a manner that their activity is inhibited through this event. In parallel to this publication in the journal Nature Biotechnology, a second study appeared in Nature Medicine [Paywall], published by the group led by Anderson at MIT and researchers at Harvard University. The researchers at Harvard University had already succeeded in October 2014 in raising beta cells from human stem cells. In order to demonstrate that capsules composed of triazole thiomorpholine (TMTD) alginate are able to protect beta cells from the body’s defence cells without hindering the beta cell’s hypoglycemic function, the researchers packed these cells in three different capsules: 500 micron alginate microcapsules, 1.5 mm alginate capsules and 1.5 mm TMTD-alginate capsules. For the tests, the scientists administered streptozocin to mice with a strong immune response. This substance kills endocrine cells such as beta cells in the pancreas. 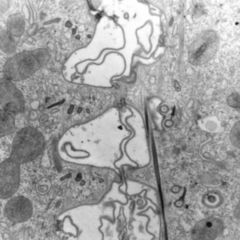 Following this, packed and unpacked beta cells were injected in the peritoneal cavity of the animals. Whereas the insulin-producing cells without algae polymer did not normalise blood sugar levels, beta cell-containing microcapsules managed to achieve this for 15 days. For the animals which had received the 1.5 mm alginate capsules, the scientists recorded standard insulin production levels for a full 30 days. The best results were however obtained from the beta cells packed in 1.5 TMTD-alginate capsules. The blood glucose levels corresponded to those of healthy animals for 174 days. After almost six months, the implants were removed. The researchers found only minimal collagenous and cellular depositions, but no scar tissue. Should the method be successful, it would not only be type 1 diabetics who benefit. This is because, apparently as a result of conflicts of interest, Harvard University and the Howard Hughes Medical Institute have secured the patent rights for the production of the beta cells from stem cells. The Massachusetts Institute of Technology has had both the material and the hydrogel capsule patented. Across the world other research groups are working on causal therapy. 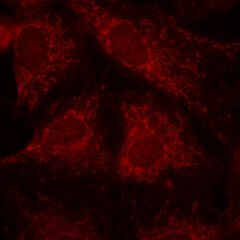 For example, in early January a group led by Sheng Ding of the Gladstone Institute in San Francisco succeeded in converting human skin fibroblasts into beta cells. These were then transplanted into mice which had previously been treated with streptozocin. The result: the beta cells poured out the right amount of insulin under conditions of elevated blood sugar levels. However, the problem was low yield, as was the fact that the genes used in the production of the beta cells can cause cancer. A different approach was developed by a team of scientists at the University of California in San Francisco [Paywall]. Their idea is not to suppress the immune system after transplantation, but to “reeducate” it, ie. 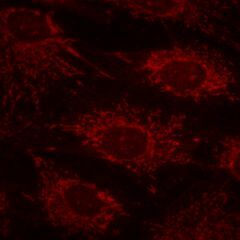 to tolerate the foreign cells. For this purpose, they propagated so-called regulatory T-cells which they had previously extracted from type 1 diabetics, and then administered these to the patients again. One year later up to 25 percent of the injected cells were still detectable in the blood. Regulatory T-cells are the cytotoxic T-cells’ antagonists and seem to protect the body’s own cells from the immune system. Further studies are nevertheless needed so as to show how effective this immunotherapy is. Cure of type 1 diabetes in sight? If all goes well, this innovation could revolutionise the treatment of diabetes mellitus type 1. “We believe that beta cells cultured from human stem cells and packaged into capsules have the potential to offer patients with this disease independence from insulin”, the authors declare optimistically. Nevertheless, there is still a long way to go until then. Before the TMTD-alginate capsules containing beta cells can be tested in human clinical trials, further investigations, such as with primates, are necessary. Whether the method succeeds in the end still therefore remains to be seen. Mr. Wiggin: you know this article is about type 1, which is an auto-immune disease and NOT lifestyle-related? While living a healthier life, including a meat-free diet, will help our general health and the planet as a whole, it will not cure type 1 diabetes. I pity your poor family member with type 1. It is crushing when those close to us refuse to learn the difference between the types. (not that Type 2s deserve your scorn either). Interesting thought Joop and I agree we as individuals look to do every thing for our close family but that doesn’t always make it right. I already have a close family member with type 1 and so know all about insulin, coma etc. In principle I believe we should stop all animal research and concentrate on living better. Top of the list for a clean green water rich world is to eat and live vegan and that doesn’t need any more research either. We know it works. Althought I agree with the first part of your statment I also wonder if you would still feel the same about experimenting when your 4 year old develops diabetes type 1.
it would be great to accept these diseases are caused more and more by our life style and prevention would be better than cure, and that additionally we don’t have the right to “experiment” on other sentient beings for this or any other cure.